Feb 27, 2013 - N.A. Capitalism has the capacity to advance social cooperation and human progress if applied consciously. 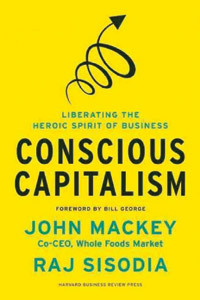 Whole Foods Market co-founder John Mackey and Columbia University marketing professor Raj Sisodia both argue for the intrinsic values of both business and capitalism. Profiling some of the most popular companies, the book demonstrates how the two powerful forces positively create value for all those affected—from the investors, suppliers, workers, customers to the environment. Some of these companies who use “conscious capitalism” include Whole Foods Market, Costco, Google, The Container Store, UPS and many others. The authors say these companies utilize the following tenets (higher purpose, stakeholder integration, conscious leadership and conscious culture and management) to create strong, resilient businesses that advance capitalism. The authors believe that new businesses and entrepreneurs should follow this path toward social cooperation and humanity for the sake of good business and the society as well. Free-enterprise capitalism is the most powerful system, according to the authors, to achieve cooperation and human progress.